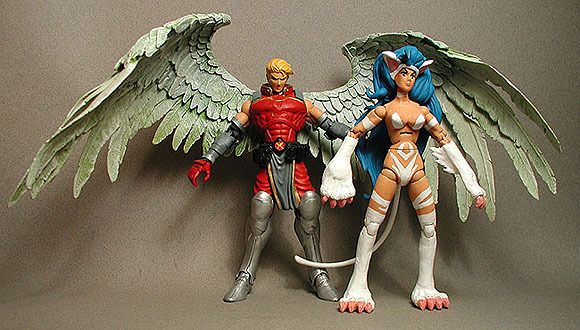 The Angel base is a Warlands Count Aalok figure + McFarlane Spawn wings with sculpted torso, armbands and gloves. Felicia is a SOTA Cammy figure with sculpted arms, legs, hair, ears and breasts. Rubber bracelet for the tail. JLU Dove repainted. 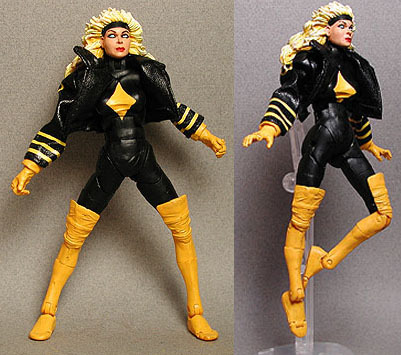 SSK is a Mattel Batgirl with sculpted hair, arms and boots. ML Rogue with Wolverine New X-Men jacket. 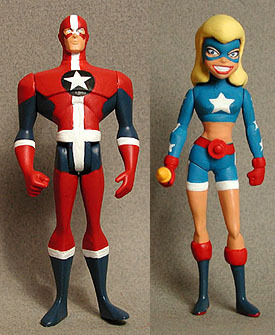 ML Ultimate Captain America with rubber coat. Sculpted chest, mask and belt. 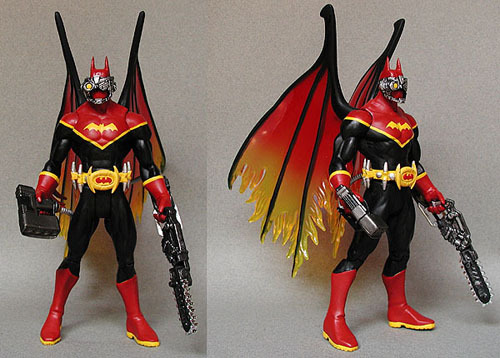 Mattel Batman with Gargoyles fire wings + myriad accessories. This was a recent birthday gift for Crushinaguy. 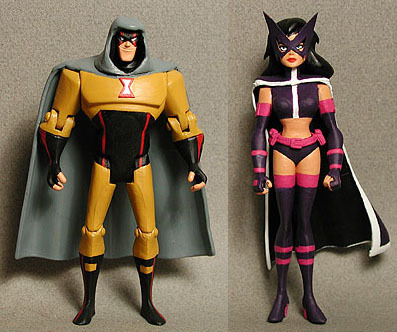 JLU Batman body and Flash head with sculpted hood JL Wonder Woman with Magdeline cape & a cut vinyl mask. JLU flash with Epson printed vest and sash. Cut vinyl energy rings. 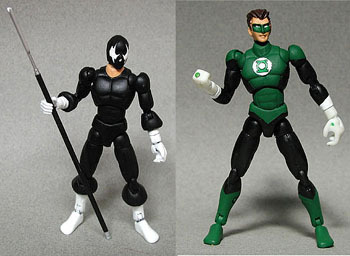 Hal is a Mattel Nightwing with resculpted hair. Masterforce Microman bases smoothed over with resin and painted accordingly. 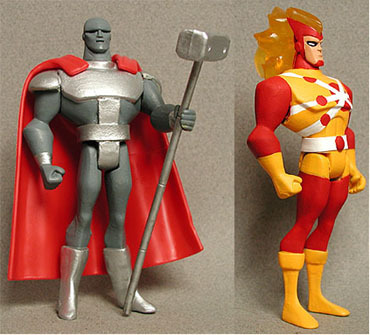 JLU Red Tornado and a Superman Cape make up most of Steel with sculpted boots, belt and shoulder pads. 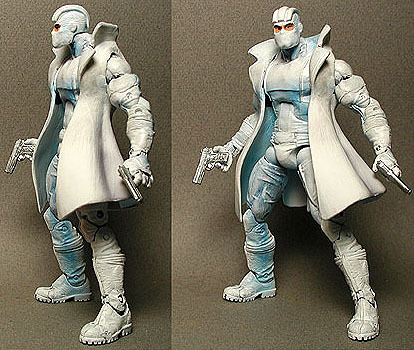 Firestorm is a JLU Waverider base with sculpted boots and cut vinyl belt and mask. 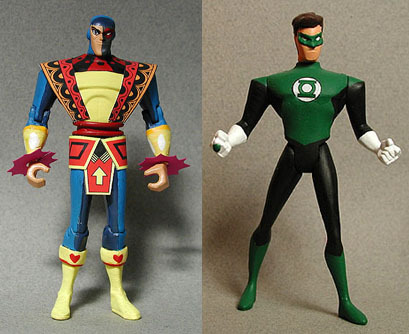 All images, format, content, and design are copyright © 1994-2003 Raving Toy Maniac. No part of these pages may be reproduced without express written consent of the Raving Toy Maniac. Licensed character names and images are copyright © their respective companies.